Please enter the code during the check-out process when ordering on www.thelifestyler.nz. 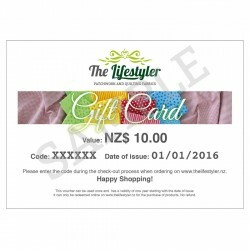 This voucher has a validity of one year starting with the date of issue.It only can be redeemed online on www.thelifestyler.nz for the purchase of products. No refund. After receiving payment we will send you an email containing the gift card as a PDF document.